The U.S. Geological Survey (USGS), in cooperation with the U.S. Department of Energy, evaluated a three-dimensional model of groundwater flow in the fractured basalts and interbedded sediments of the eastern Snake River Plain aquifer at and near the Idaho National Laboratory to determine if model-derived estimates of groundwater movement are consistent with (1) results from previous studies on water chemistry type, (2) the geochemical mixing at an example well, and (3) independently derived estimates of the average linear groundwater velocity. Simulated steady-state flow fields were analyzed using backward particle-tracking simulations that were based on a modified version of the particle tracking program MODPATH. Model results were compared to the 5-microgram-per-liter lithium contour interpreted to represent the transition from a water type that is primarily composed of tributary valley underflow and streamflow-infiltration recharge to a water type primarily composed of regional aquifer water. This comparison indicates several shortcomings in the way the model represents flow in the aquifer. The eastward movement of tributary valley underflow and streamflow-infiltration recharge is overestimated in the north-central part of the model area and underestimated in the central part of the model area. Model inconsistencies can be attributed to large contrasts in hydraulic conductivity between hydrogeologic zones. Sources of water at well NPR-W01 were identified using backward particle tracking, and they were compared to the relative percentages of source water chemistry determined using geochemical mass balance and mixing models. The particle tracking results compare reasonably well with the chemistry results for groundwater derived from surface-water sources (–28 percent error), but overpredict the proportion of groundwater derived from regional aquifer water (108 percent error) and underpredict the proportion of groundwater derived from tributary valley underflow from the Little Lost River valley (–74 percent error). These large discrepancies may be attributed to large contrasts in hydraulic conductivity between hydrogeologic zones and (or) a short-circuiting of underflow from the Little Lost River valley to an area of high hydraulic conductivity. Independently derived estimates of the average groundwater velocity at 12 well locations within the upper 100 feet of the aquifer were compared to model-derived estimates. Agreement between velocity estimates was good at wells with travel paths located in areas of sediment-rich rock (root-mean-square error [RMSE] = 5.2 feet per day [ft/d]) and poor in areas of sediment-poor rock (RMSE = 26.2 ft/d); simulated velocities in sediment-poor rock were 2.5 to 4.5 times larger than independently derived estimates at wells USGS 1 (less than 14 ft/d) and USGS 100 (less than 21 ft/d). The models overprediction of groundwater velocities in sediment-poor rock may be attributed to large contrasts in hydraulic conductivity and a very large, model-wide estimate of vertical anisotropy (14,800). 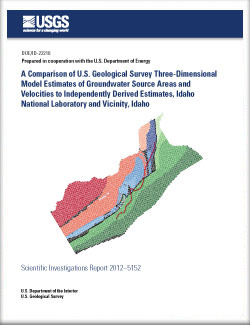 Fisher, J.C., Rousseau, J.P., Bartholomay, R.C, and Rattray, G.W., 2012, A comparison of U.S. Geological Survey three-dimensional model estimates of groundwater source areas and velocities to independently derived estimates, Idaho National Laboratory and vicinity, Idaho: U.S. Geological Survey Scientific Investigations Report 2012-5152 (DOE/ID-22218), 130 p.